School Improvement Network has launched PD 360 4.0, an update to the company's teacher professional development tool and learning community. 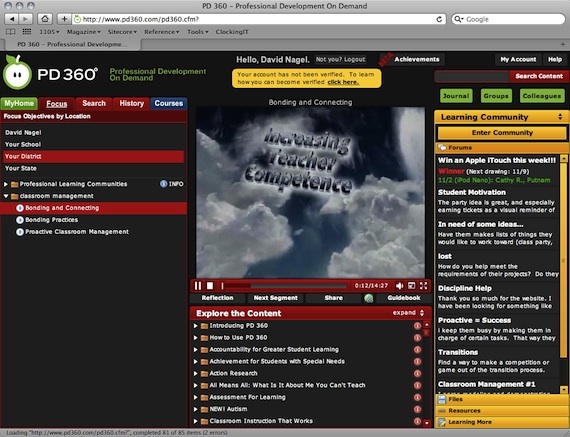 PD 360 is an online, on-demand professional development system for educational institutions that provides instructional video content for teachers, administrators, and other staff. Targeted toward larger districts with staff dispersed over wide areas, PD 360 provides video content covering topics ranging from differentiated instruction to assessment to working with ELL students. It offers tracking and reporting, digitized guidebooks, customization for state and district standards, and other technologies to aid with professional development. According to School Improvement Network, it's in use by more than 700,000 individuals in education. The latest release includes enhancements to the user interface and workflow designed to simplify navigation and provide a look and feel familiar to social networking users. Embedded content within PD 360's communities. PD 360 4.0 is available now. Further information, including a demonstration and free 30-day trial, can be found here.